The College of Law has entered into 3+3 admissions agreements with three Historically Black Colleges and Universities (HBCU) located at Atlanta University Center: Clark Atlanta University, Morehouse College and Spelman College. 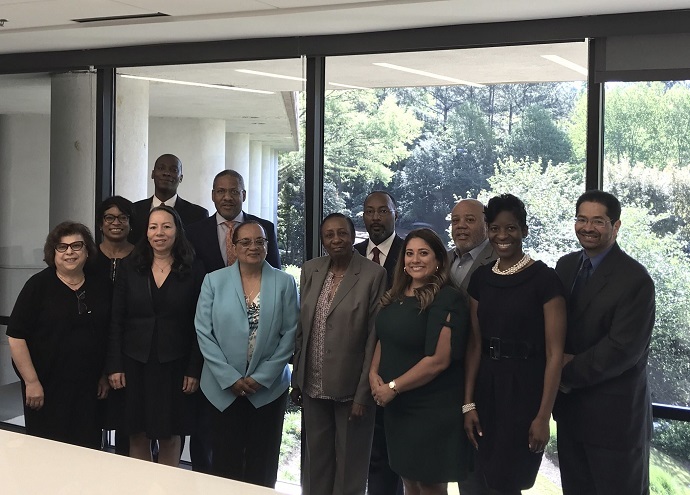 The agreement was signed at an April 15 ceremony at Atlanta-based law firm Taylor English Duma LLP with representatives from all three HBCU and the College of Law participating. The 3+3 program allows students to finish the bachelor’s and juris doctor degrees in an accelerated format by completing all coursework required for the undergraduate major in three years and finishing their degree during their first year of law school at Syracuse. J.D. students at the College of Law may also jointly earn a master’s degree at other Syracuse University schools and colleges, including the top-ranked Maxwell School of Citizenship and Public Affairs and the Newhouse School of Public Communications. The combination of the 3+3 and joint degree programs permits a student to earn as many as three degrees in just six years—a year less than generally required for just an undergraduate and J.D. degree at most other institutions. “I am excited by the opportunities that this program will provide for our students who are interested in pursuing careers in law. This program is a testament to Dean Boise’s and Syracuse’s commitment to the recruitment of black students, and I hope it serves as a model for law schools across the nation,” says Matthew B. Platt, Ph.D., chair and associate professor, Department of Political Science, Morehouse College. In addition to the 3+3 agreements, the College of Law recently expanded its Externship Program to Atlanta to provide field placements in the city and its surroundings, allowing local students to network and to gain experience close to home. The College of Law also has a liaison in Atlanta who will be on campus to meet with students and answer any questions about the program. Clark, Morehouse and Spellman colleges join Alfred University, Le Moyne College, Nazareth College, St. John Fisher College and Syracuse University’s Whitman School of Management as 3+3 partners of the College of Law.